From 15 mar 2019-17 mar 2019 in this round played 10 matches, 2 of them was ended in a draw. 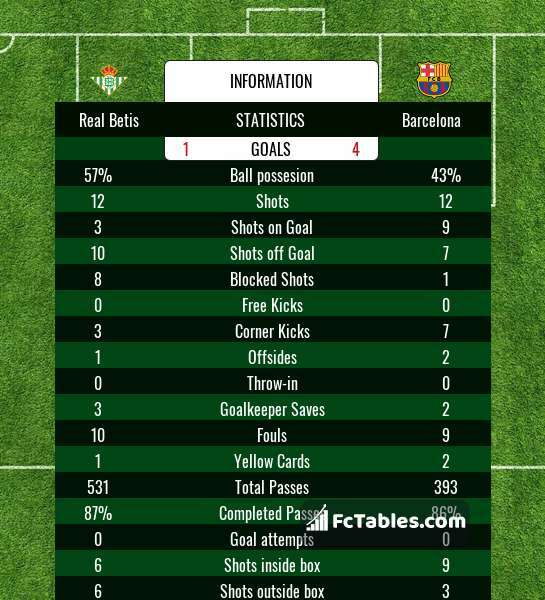 Most goals was in matches: Real Betis - Barcelona (5 goals). In round was a total of 25 goals. In previous round team scored 32 goals. At all stadiums watched games 279796 spectators. In previous round: 307990. Here you can check actual La Liga table. For Real Sociedad only in La Liga the most goals scored: Mikel Oiarzabal 10 goals, Willian Jose 9 goals. Team the most matches played with formation: 4-4-2. 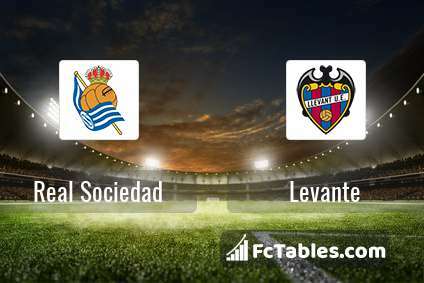 Real Sociedad at home won 4 matches, 5 draws and 5 defeits. Real Sociedad scored average of 1.18 goals per game. In matches played at home 1.07 goals per game. In matches played at home an average of 2.14 goals (with opponent goals). For Levante only in La Liga the most goals scored: Roger 10 goals, Jose Luis Morales 8 goals. Team the most matches played with formation: 4-4-2. Levante away won 4 matches, 4 draws and 7 defeits. 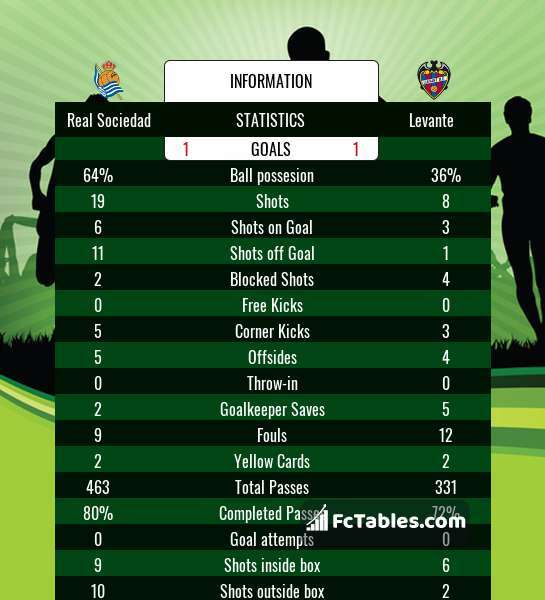 Levante scored average of 1.36 goals per game. In matches played away 1.33 goals per game. In matches played away an average of 2.93 goals (with opponent goals). Before the game team Real Sociedad in table was 9, Levante was: 15. The match ended with the result 1:1. For Athletic Bilbao only in La Liga the most goals scored: Inaki Williams 8 goals, Iker Muniain 6 goals. Team the most matches played with formation: 4-2-3-1. Athletic Bilbao at home won 6 matches, 7 draws and 2 defeits. Athletic Bilbao scored average of 1.00 goals per game. In matches played at home 1.07 goals per game. In matches played at home an average of 1.93 goals (with opponent goals). For Atletico Madrid only in La Liga the most goals scored: Antoine Griezmann 12 goals, Alvaro Morata 3 goals. Team the most matches played with formation: 4-4-2. Atletico Madrid away won 5 matches, 6 draws and 3 defeits. Atletico Madrid scored average of 1.39 goals per game. In matches played away 1.14 goals per game. In matches played away an average of 2.00 goals (with opponent goals). 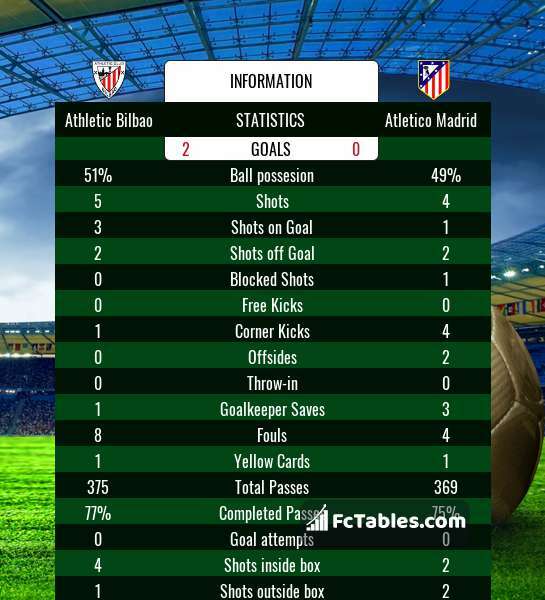 Before the game team Athletic Bilbao in table was 12, Atletico Madrid was: 2. The match ended with the result 2:0. For Leganes only in La Liga the most goals scored: Youssef En-Nesyri 8 goals, Guido Marcelo Carrillo 5 goals. Team the most matches played with formation: 4-4-2. 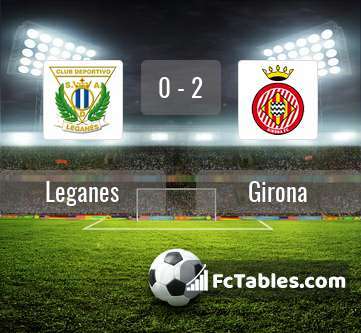 Leganes at home won 6 matches, 6 draws and 2 defeits. Leganes scored average of 0.96 goals per game. In matches played at home 1.21 goals per game. In matches played at home an average of 2.07 goals (with opponent goals). For Girona only in La Liga the most goals scored: Cristian Stuani 16 goals, Cristian Portu 6 goals. Team the most matches played with formation: 3-4-2-1. Girona away won 6 matches, 4 draws and 4 defeits. Girona scored average of 1.11 goals per game. In matches played away 1.29 goals per game. In matches played away an average of 2.43 goals (with opponent goals). 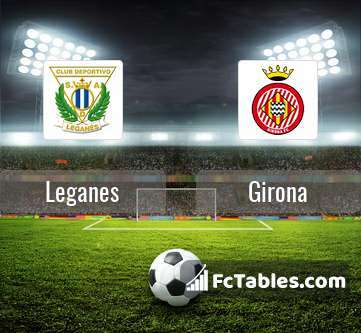 Before the game team Leganes in table was 13, Girona was: 14. The match ended with the result 0:2. For Real Madrid only in La Liga the most goals scored: Karim Benzema 13 goals, Gareth Bale 8 goals. Team the most matches played with formation: 4-3-3. Real Madrid at home won 9 matches, 1 draws and 4 defeits. Real Madrid scored average of 1.75 goals per game. In matches played at home 1.50 goals per game. In matches played at home an average of 2.07 goals (with opponent goals). For Celta Vigo only in La Liga the most goals scored: Iago Aspas 10 goals, Maximiliano Gomez 9 goals. Team the most matches played with formation: 4-4-2. Celta Vigo away won 2 matches, 3 draws and 9 defeits. Celta Vigo scored average of 1.29 goals per game. In matches played away 1.21 goals per game. In matches played away an average of 3.21 goals (with opponent goals). Before the game team Real Madrid in table was 3, Celta Vigo was: 18. The match ended with the result 2:0. 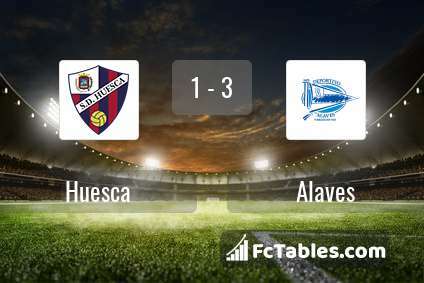 For Huesca only in La Liga the most goals scored: Ezequiel Avila 6 goals, Juan Hernandez 3 goals. Team the most matches played with formation: 4-4-2. Huesca at home won 3 matches, 4 draws and 7 defeits. Huesca scored average of 1.00 goals per game. In matches played at home 1.07 goals per game. In matches played at home an average of 2.50 goals (with opponent goals). For Alaves only in La Liga the most goals scored: Jonathan Calleri 6 goals, Jony 4 goals. Team the most matches played with formation: 4-4-2. Alaves away won 6 matches, 2 draws and 7 defeits. 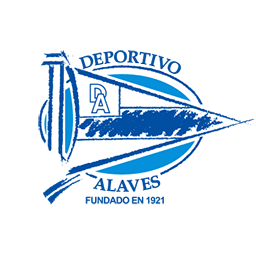 Alaves scored average of 1.11 goals per game. In matches played away 1.13 goals per game. In matches played away an average of 2.67 goals (with opponent goals). Before the game team Huesca in table was 20, Alaves was: 5. The match ended with the result 1:3. For Valencia only in La Liga the most goals scored: Daniel Parejo 7 goals, Rodrigo 5 goals. Team the most matches played with formation: 4-4-2. Valencia at home won 4 matches, 10 draws and 1 defeits. Valencia scored average of 1.07 goals per game. In matches played at home 1.07 goals per game. In matches played at home an average of 1.60 goals (with opponent goals). For Getafe only in La Liga the most goals scored: Jaime Mata 13 goals, Jorge Molina 10 goals. Team the most matches played with formation: 4-4-2. Getafe away won 4 matches, 9 draws and 2 defeits. Getafe scored average of 1.29 goals per game. In matches played away 1.07 goals per game. In matches played away an average of 2.07 goals (with opponent goals). Before the game team Valencia in table was 7, Getafe was: 4. The match ended with the result 0:0. For Real Betis only in La Liga the most goals scored: Sergio Canales 6 goals, Giovani Lo Celso 5 goals. Team the most matches played with formation: 4-4-2. 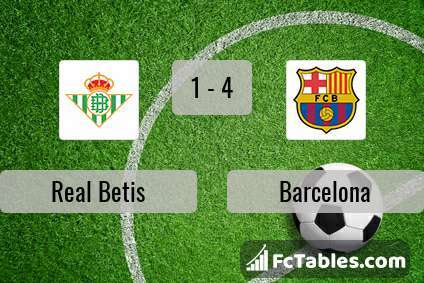 Real Betis at home won 6 matches, 4 draws and 5 defeits. Real Betis scored average of 1.14 goals per game. In matches played at home 1.27 goals per game. In matches played at home an average of 2.67 goals (with opponent goals). For Barcelona only in La Liga the most goals scored: Lionel Messi 29 goals, Luis Suarez 18 goals. Team the most matches played with formation: 4-3-3. Barcelona away won 10 matches, 3 draws and 1 defeits. Barcelona scored average of 2.61 goals per game. In matches played away 2.21 goals per game. In matches played away an average of 3.00 goals (with opponent goals). 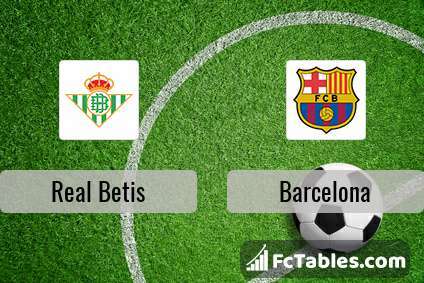 Before the game team Real Betis in table was 8, Barcelona was: 1. The match ended with the result 1:4. For Espanyol only in La Liga the most goals scored: Borja Iglesias 11 goals, Esteban Granero 3 goals. Team the most matches played with formation: 4-3-3. Espanyol at home won 8 matches, 1 draws and 5 defeits. Espanyol scored average of 1.14 goals per game. In matches played at home 1.36 goals per game. In matches played at home an average of 2.71 goals (with opponent goals). For Sevilla only in La Liga the most goals scored: Wissam Ben Yedder 16 goals, Pablo Sarabia 9 goals. Team the most matches played with formation: 3-5-2. 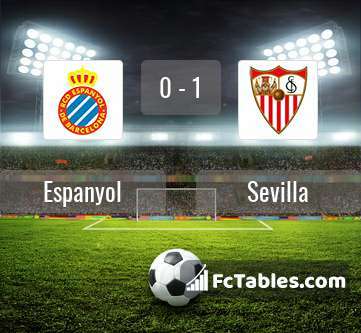 Sevilla away won 4 matches, 4 draws and 7 defeits. Sevilla scored average of 1.68 goals per game. In matches played away 1.33 goals per game. In matches played away an average of 2.80 goals (with opponent goals). Before the game team Espanyol in table was 11, Sevilla was: 6. The match ended with the result 0:1. For Eibar only in La Liga the most goals scored: Charles 12 goals, Sergi Enrich 6 goals. Team the most matches played with formation: 4-4-2. 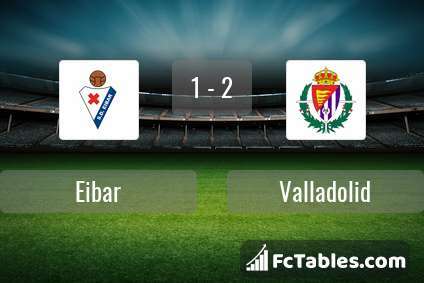 Eibar at home won 7 matches, 5 draws and 3 defeits. Eibar scored average of 1.29 goals per game. In matches played at home 1.73 goals per game. In matches played at home an average of 2.87 goals (with opponent goals). For Valladolid only in La Liga the most goals scored: Oscar Plano 3 goals, Enes Unal 3 goals. Team the most matches played with formation: 4-4-2. Valladolid away won 4 matches, 5 draws and 6 defeits. Valladolid scored average of 0.82 goals per game. In matches played away 0.80 goals per game. In matches played away an average of 2.13 goals (with opponent goals). 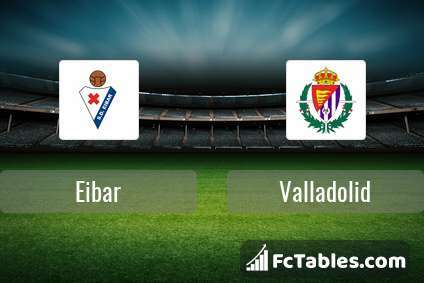 Before the game team Eibar in table was 10, Valladolid was: 16. The match ended with the result 1:2. For Villarreal only in La Liga the most goals scored: Karl Toko Ekambi 6 goals, Gerard Moreno 5 goals. Team the most matches played with formation: 4-4-2. Villarreal at home won 3 matches, 6 draws and 6 defeits. Villarreal scored average of 1.14 goals per game. In matches played at home 1.33 goals per game. In matches played at home an average of 2.67 goals (with opponent goals). For Rayo Vallecano only in La Liga the most goals scored: Raul de Tomas 11 goals, Adrian Embarba 3 goals. Team the most matches played with formation: 4-1-4-1. Rayo Vallecano away won 3 matches, 1 draws and 10 defeits. Rayo Vallecano scored average of 1.07 goals per game. In matches played away 0.71 goals per game. In matches played away an average of 2.29 goals (with opponent goals). Before the game team Villarreal in table was 17, Rayo Vallecano was: 19. The match ended with the result 3:1.